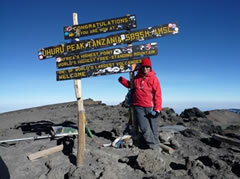 I, along with nine others, reached the summit of Mount Kilimanjaro in October 2008. When the earthquake hit Northern Pakistan three years earlier, the images of devastation were very powerful and humbling. A couple of years on and I felt unsatisfied at my contribution through donating so I decided upon climbing Mount Kilimanjaro. 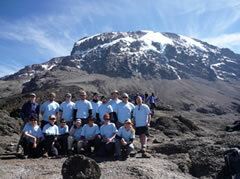 The trip raised almost £7,500. 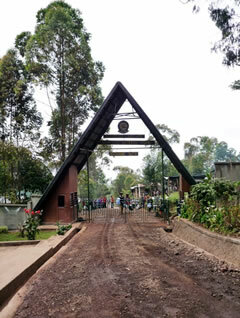 The trek took six days and started off in dense jungle, moving through forest and heading above the cloud line. We trekked through moorland, traversing The Barranco Wall, culminating in the steep ascent up to the summit and finally completing our descent. I can say without exception it was the most difficult challenge I have set myself but worth every breathless step! Each day would involve walking 6-7 hours, ascending on average 1000m with the exception of summit night. On this particular day/night, we walked some 7 hours during the day, slept from 7pm through to 11pm and commenced our summit night walk at midnight! We were encouraged to drink 3/4 litres of water per day and eat three hot meals per day. 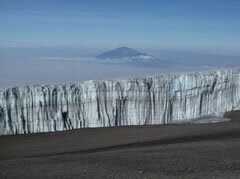 However, this was not always possible, particularly when we reached above 5000 metres. Altitude would cause a number of us to suffer with loss of appetite, headaches, and sickness. Our local guide set about setting a walking pace which we would adhere to throughout the trip. It was vital that we didn’t walk too fast, as the higher up we got, the more difficult conditions would become. The group had bonded very well and there was plenty of fun and laughter along the way, but we had a blow early on. We lost one of the team due to sickness which surprised us all. For a short period of time we were quite emotional and saddened that we were one down after only two days but we motivated each other to reach the summit for our departed team member. The pace of walking was nice and steady and before we knew it, summit night was almost upon us. This was the most difficult part of the challenge. It was eerily dark, cold and most significantly, there was less oxygen in the air, breathing was noticeably more difficult. The smallest task, such as kneeling over to shore up boot laces was taxing under such conditions. There was a moment at the beginning of our midnight ascent where I did feel the beast that is Mount Kilimanjaro had beaten me. The terrain was incredibly steep, I was breathing incredibly hard and fast, the oxygen was not getting into my lungs fast enough, altitude was taking its toll and I started to have a panic attack! However, with some fast assistance from an exceptionally well versed porter, I was able to regulate my breathing and make some speedy dua’s. Not long after this temporary panic attack and (mentally) almost giving up (!) I was back in determined mode. There were times as I looked up into the darkness, all I could see was a trail of head torch lights, at one point I could no longer distinguish between the torch lights and the stunning stars! As the night progressed and the higher we got, the more difficult breathing became. There were a number of times when we all felt very jaded. However, with the sun beginning to rise, there was a sense relief that we were no longer in darkness and closing in on achieving our goal. 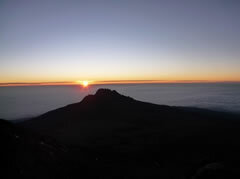 As the sun rose, we knew we were not far, with this renewed hope, momentum and a steely determination we reached the summit at approx 8:15am, I dropped to my knees and gave thanks to the Almighty! We were all shattered, there were plenty of tears and when the tears passed, jubilation followed.